– Waking Giants by Arch Stanton. I heard this in 2006, it’s a song my friends wrote. It’s about realising that you are capable of much more. September 2017. I was lucky enough to hunt down New York’s finest breweries, drinks were in hand, chats were had, a lot of similarities arose with the way we brew. And plans were a foot to create brews with some of these transatlantic heroes! January 2018. 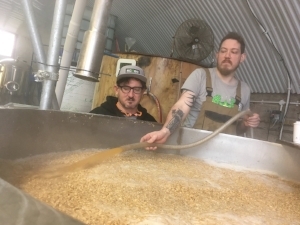 Our friends Pete and Ben at KCBC (Brooklyn, New York) decided it be the ideal moment to come and join us for beers, sightseeing, beers, feasting, beers and most importantly… Brewing… With beers (drink responsibly). So our Sleeping Giants were awoken! It’s a 5% New England style that is bursting with juicy tropical fruits! It has come out absolutely stunning! Plus Pete Fowler has produced another inspired piece of art to define the beer. 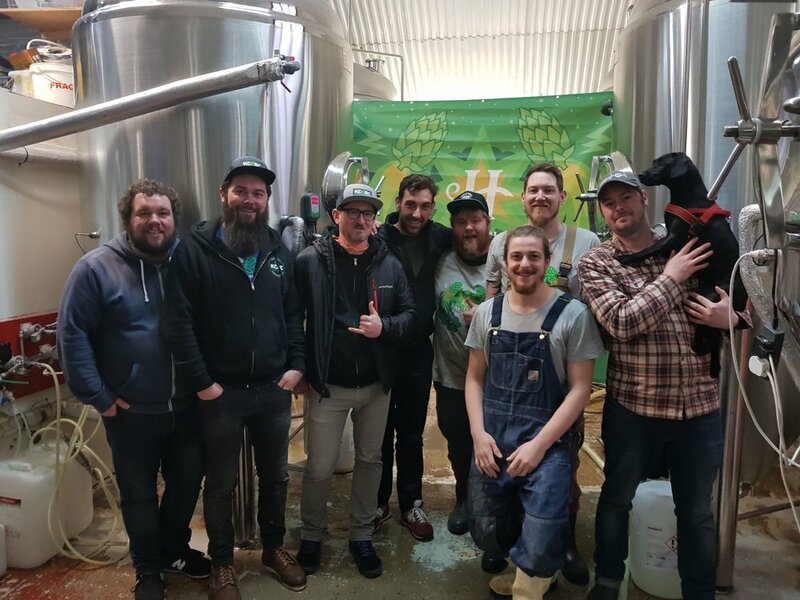 Our buddies were here for just over a week brewing with Verdant, Northern Monk, Brew By Numbers and Beavertown. So keep an eye out for their collabs too, they are bound to be delicious! KCBC's beers will be available for the first time ever in the UK Bottle Shop in Bermondsey from Wednesday 21st February. We will be launching our collaboration at The Axe in Stoke Newington on Friday. Zach from KCBC will be over and attending both of the events. We'd love to see you there too! L to R: Dan, Ben, Pete, Ricardo, Bobby, Simone, Darren, Jon and Bruce.